Numbers are an important part of baseball history. They tell us everything that has happened through the years, while also giving a basis on which to judge performance. In the last two or three decades the ways in which players are measured have changed and it has ushered in monumental changes within the game. But what if you use these current day formulas to see what the prior generations may have missed, what would change and who’s legacy would be changed forever? Well today’s book takes a look at how these calculations would have changed the history of the game. I don’t often do this, but if I had to sum this book up in one word it would be…..WOW!!!!!! Hardball Retrospective takes statistical analysis to the next level. It takes a look at every season and every team from 1901 through 2013 and reanalysed the data . By using current standards it evaluates each individual teams scouting methods and the final outcomes for each season. It shows how the standings may have been different, which really alters the entire baseball landscape as we have known it. Derek Bain has done an incredible job of reformulating team statistics and analyzing each decade. This book also does a nice job of explaining the terminology and methodology used in calculating all of these results. That is important in the fact that it will not be overwhelming for the average fan. Bain presents all of his results in easy to read charts and formats that makes it an inviting read. With some of the other statistical analysis books that are on the market the reader can feel overwhelmed and a little put off. Hardball Retrospective does a nice job of avoiding the pompousness that is sometimes contained in these types of books. Plus, what is not to love about that 70’s era picture of Rod Carew on the cover. Fans of the game should really put on their thinking caps and check this out. It puts a whole new spin on the game we love and also makes you wonder what may have been for your team. 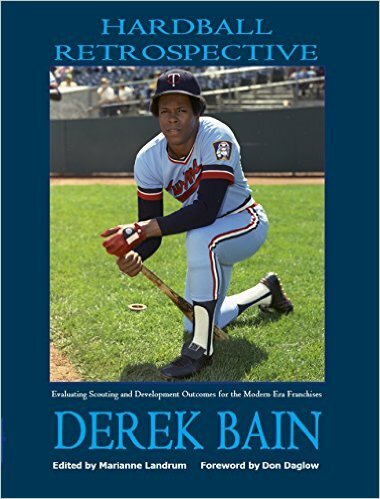 For myself being a Phillies fan and realizing they have stunk for most of their existence, this book changed the way I look at them and realize they may have been lucky more than good when the finally found some success.